Before I started the second load of laundry I had an epiphany. Wait. Let me look up the definition of epiphany, because I tend to use words without knowing the meanings. Okay, the word epiphany works, because I was in the midst of a revealing moment. My moment of realization – my epiphany – came with the following thought: If I were to take my shower first and begin the second load of laundry after the shower, I could wash what I was currently wearing. I might capture a glimpse of the ELBaEWaD! What? What do you mean you don’t get it? Oh. My apologies. Like me, you’ve never seen an ELBaEWaD, right? Like me, you were probably told countless times that ELBaEWaDs are incredibly elusive and always short-lived. Perhaps, like me, you questioned their existence. Well, question no more! They do exist! ELBaEWaDs exist! Sadly, the ELBaEWaD will exist for approximately four hours. Once the boys return home, the laundry basket will no longer be empty. Fear not! For I will not let the short life span of ELBaEWaDs bring me down. After all, I captured the moment. I captured the ELBaEWaD and all its glory. I will relish in my captured moment, until the ELBaEWaD surfaces again. And, it will surface again. Oh yes, it will surface again. That has never happened at my house. There would be some stray sock or something. I’ve got real problems. Don’t give up hope, Julie. Just remember not to look for the said sock, once everything is empty. Again, the lifespan is short. Real short. I thought that was an urban legend! But … but … I have proof! 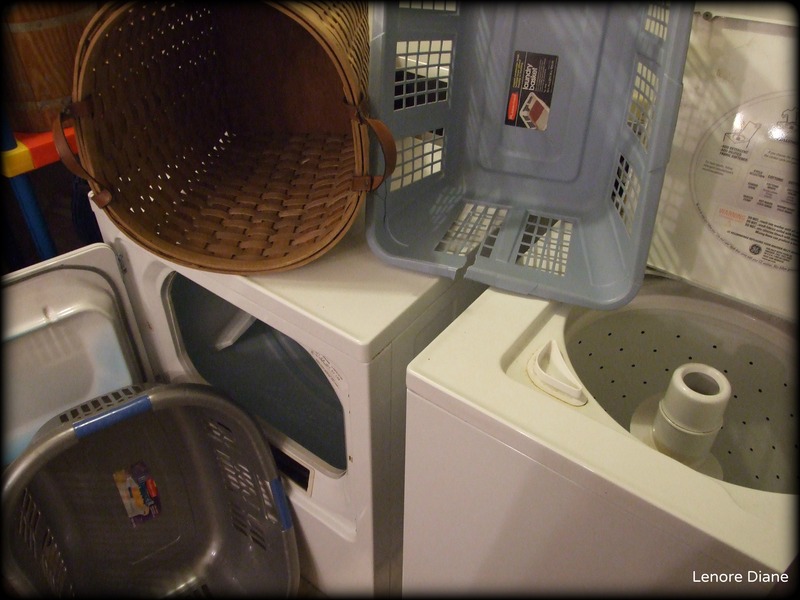 The picture shows empty baskets and an empty washer and dryer! I swear it happened, JLynne. I swear! Dare I dream it will happen again?! I believe you, truly, but you may go down in history as some mythical dragon slayer…..
Or maybe you have come across some Star Trek worm hole thing – you may wake tomorrow to find women with full baskets of laundry standing in your front yard hoping for help ! Keep trying. This should provide you with hope because it proves it CAN happen. I believe in you, Nicole. You can do it! You will see ELBaEWaD. Bella, do your best not to blink. If you blink, you might miss it. I’m rooting for you! It’s good to have a dream, isn’t it? It is, Lisa. Until today, I thought dreams always involved ice cream. Oh how wrong I was. I’ve never seen one… ever… never ever. You will. Keep trying and you will find ELBaEWaD. If I can do it – anyone can do it. It’s all I’ve ever wanted. Ever. I didn’t know I had it in me. Man, it was as good as everyone said it would be. It’s the end of the semester, girl. ELBaEWaD here I come. Semester? I’m bad so bad. I’m not even sure we own a laundry basket. I’ll check. It may be the thing covered up with clothes. Dig deep. I’ve never actually seen an empty laundry basket. Let me look again! WOW. They really do exist. Go tell others. But go quietly – ELBaEWaDs are skid’ish. Never. Saw. One. LOL–what an ingenious post! Nope. I’ve seen this on Mythbusters. It can’t happen. It can happen, Oma. I read about it on Wikipedia. It’s a true story – cited and everything! Go Lenore! My first good laugh of the day. Yay! I made you laugh. Happy to hear that fact, Maxi. Thanks! I thoroughly enjoyed this post. I’m glad, Linda. I haven’t had a chance to write a comment, yet, but I am going to check out the book you wrote about. I’m looking forward to it. I had no idea this existed! Boggles my mind! Seriously… this is a hoax, right? Like… the Bigfoot of laundry? Green screen? Photoshop? Know what? I didn’t even have to edit the photo! How is that for a crazy fact?! Wow! Good for you, Lenore. I came home from my daughter’s to find hubby had been wearing clothes to work all week, and the ELBaEWaD I left behind disappeared while I was away.